If they are electric, then you can probably do the replacement by feel by just reaching up under the dash. It's in a very easy to get to place, all considered. Now, if they are mechanical, then you'll have to fish the tube through the grommet and put it up and over and in to the manifold. That's a little bit harder. Do you have the quick release hub on your steering wheel? That makes it a lot easier when working on the under-dash wiring. No...I always liked that idea. Dooe the whole hub remove, or just the wheel itself? I decided to go back out and screw with it some more. I cut the wires and tested it in the same way as the new one. Much better, but not a steady reading like the new one, but not a continuous slow climb as before. The end numbers kept changing it read between 5.9-6.1 ohm. I then took the rotor off and rapped it like you suggested, and pig-tailed the wires back together. Those wires are just long enough. After cutting , stripping and rejoining with a cap, was really to tight. I tried to crank it and still no spark. At that point I decided I was going to change out the pick-up , after all, that is why I bought it 4 years ago. I put PB blaster on the rotor screws and the Magnetic pick-up hold down nuts. One nut is pretty easy to get at but it appears the threads are stripped and it wont come off, just keeps turning around and around. The other nut is very close to the magnet body so a socket will not clear past it.Using a wrench will also be and issue because of the turkey pan. Why would they the frame so close to the nut, there is a ton of room in there. Last edited by davids2toys; 10-25-2018 at 10:09 PM.. Sounds like 5.9 - 6.1K ohms, 5900 - 6100 ohms, way out of spec, considered open circuit. Change out the pickup, set the airgap, refit the rotor and cap, and fire her up. No drilling, please. No distributor removal either. I have an extra magnetic pickup kit, so I measured it for you. The button head screw comes up from under the distributor. A 9/64" hex fits it. The locknut is 11/32". 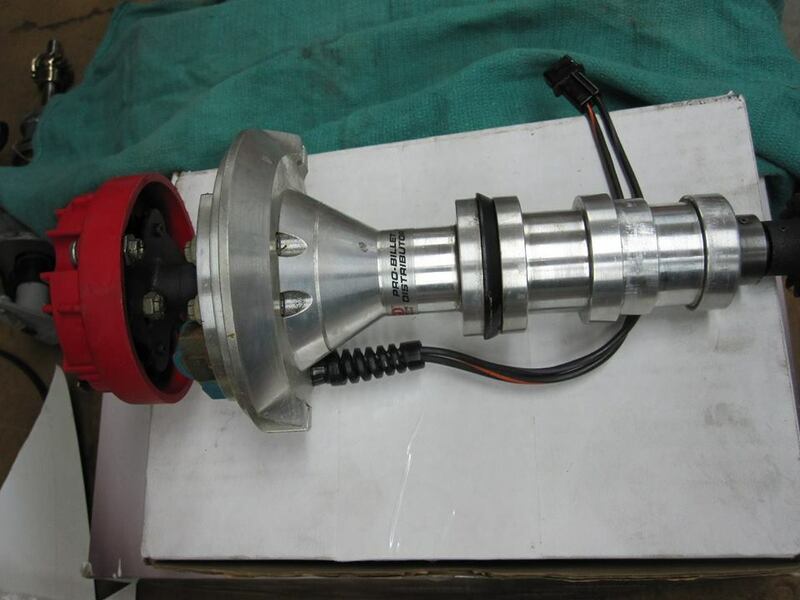 Do not pull the distributor out of the engine except as a last gasp solution. But remember, the "orientation" of your magnetic pickup is based on the whim of your engine builder. Also remember that you can turn your distributor one way or another to gain a little room to get your Allen wrench under there. Once you have the screw locked down from turning, just use whatever you can get over the nuts to take them off. Here, I went down to my car and put a mechanic's mirror angled to show you where they are. Here's an even better picture than my angled mirror shot above. 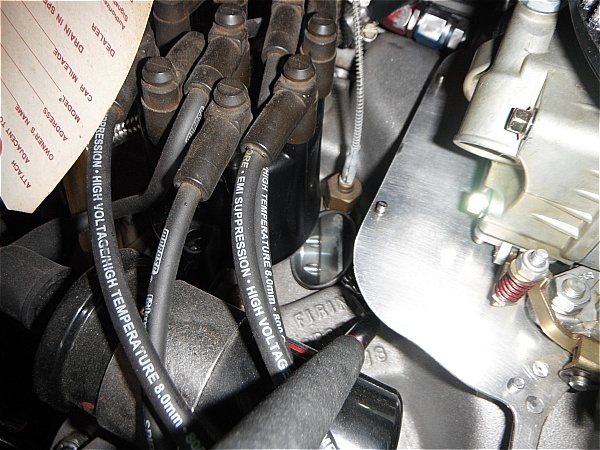 Note in the instructions https://www.jegs.com/InstallationIns.../121-84661.pdf that there is the chance, if you try really really hard, that you can put the magnet in backwards and the engine won't run. Pay particular attention to the stripe on the end of the magnet. If the car won't start after you put your magnetic pickup back in then you did indeed manage to put the magnet in backwards. The old one is erratic, any where from .59-.72 M ohms which converts to 59000 ohms. So you think the whole bolt is turning huh? I am thinking the bolt treads into the distributor body so if you were trying to remove the nut in a CCW direction, you would be tighten the bolt. That is why I think it is stripped. If you look at your kit you will see one of those nuts is very close to the frame of the magnet so you cant get a socket on there. I don't see where the location of the pick up is up to the builder, the hole in the part are going to the fixed location of the bolts? Maybe I am niot understanding you correctly. The reason I mentioned removing the distributor is there is a PDF from MSD that tells you to do it. I tried to post it but it is bigger that the forum limit of 39KB. If you pm me your email I will send it to you. If I am replacing the hardware does it really matter how I get the nuts and bolts out. I was not sure those bolt were going to be used or the old ones stay in place and act as studs. ... and the reason I am hesitant about you pulling your distributor out is that I have this vision of you writing "the distributor came right up very easily, but as I was lifting it out I heard something go clack as if it fell down in to the oil pan or something...."
Yes, I fully understand what you are saying here I did talk to a MSD tech a few hours ago, he said the holes have no threads, so yes, the whole bolt is spinning. I might go out in a few minutes and give it a shot. He also mentioned drilling holes in the cap to keep the rust and corrosion down by creating one atmosphere. Believe it or not he said (3) 1/4" holes around the base of the cap. I could see maybe (2) 1/8" holes, one on each side. Any thoughts on this? He also mentioned spaying the pick-up and reluctor with WD-40..
Last edited by davids2toys; 10-26-2018 at 01:25 PM.. Yes, holes in cap as mentioned. Like any bare metal, WD40 or oil will help prevent rust. The rust occurs from bare steel AND the atmosphere within the cap. Not sure on the torque spec, but not too tight on the pickup nuts. Hey, this thing is going to run again...YAY! I installed the pickup and as you said, went pretty good. I am having problems with that anti chafe plastic gizmo the wires go thru. I was running out of time so I gave up on that for now. I connected the wires , powered on the battery, key on, coil wire tester re-installed, hit the remote starter and a beautiful intense blue spark was happily seen! I will pick up after I get back from vacation. Hard to believe it just quit suddenly. I guess if it is going to die, better in your own garage than stranded on the side of the road! So what about these holes in the cap? What do you guys think of (3) 1/4" holes, I think that is way to much. What size holes did you drill ? Where and how many. Any advice on that plastic piece that goes around the wires and sits in the hole in the bottom of the distributor. Lastly, thank you guys for the help with this, I really appreciate it a lot!!! This is what is so great about forums! Hopefully treads like this will help others. Did you the pull the wires back through the grommet tube one at a time? I think the tube goes in the housing first. I never doubted you for a moment. Fish the wires through the anti-strain plastic funnel, solder and shrink wrap the connections, and then you might want to just check the timing since shifting the pickup a little bit from the last one can change the timing a hair. OK, I was trying to put it with both the wires already inside! Does it go in from the top or the bottom? I will try it your way when I get back. I was rushing...never a good thing! Thank you for the guidance...you were right, pretty easy and I learned a lot! Are you talking about the pigtail connections? Obviously you must be. Are suggesting I take the wires out of the plastic holders and solder them together where you won't be able to break them apart for trouble shooting or anything else?